Operated by the Circle of Friends and Supporters of the Villa Aurora in Berlin and the Friends of the Villa Aurora in Los Angeles, the former house of German novelist Lion Feuchtwanger and his wife Marta is host each year to numerous artists, musicians, and writers (of essays, fiction, drama and poetry), who stay for several weeks at the Villa creating and occasionally performing for local Los Angeles audiences. The house was built as a model house—in the style that is described as “a rambling, welcoming reminder of Italian villas”—in 1927. Its location in the Palisades above Sunset Boulevard overlooking the Pacific Ocean provides one of the most breathtaking of views from its windows and gardens of the city and ocean. 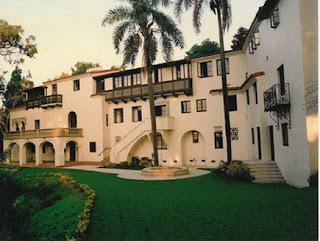 Feuchtwanger and his wife moved to Los Angeles in 1941, and in 1943 bought the Villa, opening their doors to a host of other German émigrés and artists who had proceeded and followed them to Los Angeles, including Vicki Baum, Bertolt Brecht, Bruno Frank, Gina Kaus, Heinrich and Thomas Mann, Ludwig Marcusse, and Franz Werfel. Other frequent guests at the Villa’s dinner and teas included Charles and Oona Chaplin, film-director William Dieterle and his wife, Hanns and Lou Eisler, Peter Lorre, and Arnold and Gertrude Schoenberg. Among the contemporary German poets who have been invited to the Villa and have written there are Austrian poet Oswald Egger, and German poets Dieter M. Gräf, Durs Grünbein, Michael Lentz, Said, Silke Scheuermann, Sabine Scho, Lutz Seiler, and Zafer Şenocak.